Some laid back, goofy fun, this movie gets the tone and humor right, and that goes a long way. 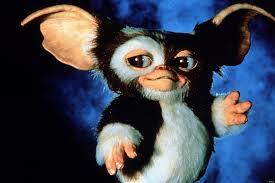 Gremlins is a light hearted entertaining time at the movies. You wouldn’t think that from the images of these monstrous slimy green creatures, but despite their look, everything in this movie is played for humor instead of horror. And the story itself about a cute little pet names Gizmo, and how he slowly produces these scary looking things, turns out to be somewhat creative. Especially when it comes to the three rules and how the transformation goes through multiple stages. By the climactic ending, we do find ourselves in a routine movie, but it’s the getting to this point that is really all the fun. Gremlins is a fun little creature movie. It’s the kind of thing that could have easily been played for horror and ended up just like a whole bunch of other little monster films (from Critters to The Gate.) Only the makers of this movie had a different agenda. Humor. Find ways to make the Gremlins funny (example: having them ring s doorbell and be singing Christmas carols when the door opens,) and there’s no telling where it could end up. And that’s exactly what happens. Aside from the big green monstrous creatures that we get terrorizing the town, there’s also Gizmo, a cute little furry thing, that acts as a pet to our hero, going with him from place to place. Having more than one type of creature and also having them be so very different, really goes a long way. At the start of the movie, we are in the back alleys of a dimly lit Chinatown. A weery explorer wanders the streets, his voice over explaining to us his situation. The man is out looking for a present for his son. Something unique and special. His search takes him into the tiny shop of an old man, where he finds and purchases Gizmo, a cute, furry little thing with giant ears and a face that puts the Ewoks to shame. The man buying Gizmo is an inventor who makes strange but potentially useful creations. He tries to sell them everywhere he goes, including right there in the old men’s shop in Chinatown. After leaving the shop, we meet Billy and his mom, and right away can tell this is the family of the man at the beginning, based on the amount if ridiculous inventions they are all over the house. We travel around with Billy and get to know him a bit. This includes meeting his friend who works at a bar, Kate, and his neighbor, Murray Futterman, who tells him a story about “Gremlins” being a sort of code for things going wrong during World War II. Billy’s father brings home Gizmo and hands him over to his son. He then explains the rules. Don’t put him near bright lights, don’t let him get wet, and no matter what, never ever feed him after midnight. Well, Gizmo accidentally gets wet one day, when a glass of water spills, and the fun starts from there. Bumps begin to form in his back and start moving around. Then they pop out, shooting around the room, and turn into fur balls. After this, they slowly open up to reveal other little gizmo-look a likes. There’s something not quite right about the looks likes. They aren’t nearly as cute as Gizmo and instead seek kind of evil or mischievous. I like how the movie keeps them in a box, separate from Gizmo helping us avoid any confusion. Billy brings one of the look a likes into school to show his science teacher. The creatures (both the ones at Billy’s house and also the one with the science teacher,) get their hands on food after midnight. While I like the way the creatures trick Billy into misreading the time, by pulling the wire on his clock, it’s a little too coincidental that both Billy and the science teacher experience the same problem at the exact same time. Still, seeing the slimy green cocoons that now start growing is incredibly cool. And I like the way one grows inside the cage in the teacher’s science room. 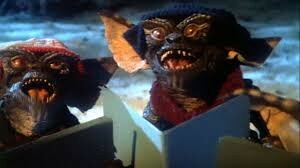 The real problem comes when one of these Gremlins (nicknamed “Stripe,” escapes the house and breaks into the local YMCA. He sneaks into the pool area, jumps in the water and the rest is history. It becomes green and bubbly with smoke rising out of it everywhere you look. An army of gremlins is now formed and they attack the town. Only they don’t do anything terrible, other then destroy a bunch of property. It’s important that they don’t kill anyone. That helps this movie maintain its playful tone. This movie is hardly anything brilliant or super smart, and it is certainly a good deal of fun. It’s light hearted entertainment that doesn’t push too hard or bang you over the head with jokes. Instead, this movie finds the perfect tone and uses that to execute its funny little story well. Even the music here is iconic and right on target for this kind of campy film.